← How Can I Help Others? When you’re waiting for the release of a new book, there’s this period that is almost unbearable. It’s about 5-6 months out, and it’s the pre-buzz period. You’ve finally seen the Advanced Reading Copy (ARC) of your book, you’ve gotten maybe a couple blurbs from authors, a few family members have read it. What you don’t have, though, is any way to gauge how the book will be received by the public. That’s exactly where I find myself with The Porcupine of Truth. I came back from the NCTE Conference (National Council of Teachers of English) a couple weeks back having said “I’m really excited about Porcupine” more times than I am comfortable to admit. It was the first time I got to sign some ARCs, and I just wanted someone to read the dang thing! For now I will focus on the comments rather than who said them, but I will say that in each case, these are PRIMO readers — educators, booksellers, book professionals — who know YA extremely well. I am obviously encouraged by these responses! 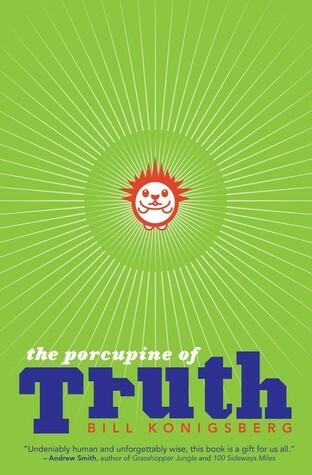 There’s simply no way to know if The Porcupine of Truth will resonate the same way Openly Straight has, or if it will break through to an even larger readership. I hope so, but in the end there is only so much I can do to get the book in reader’s hands. I will surely do everything I can, but the most important thing for now is that I feel like I poured my heart and soul into this book, and I’m proud of it. So whatever happens, I will always stand behind it! The book comes out in May 2015. Thanks, as always, for your honesty about how the book birthing process feels. Can’t wait ’til May!